Apple's iPhone always be used as a digital camera or camcorder in recent days, so it is no doubt that lots of excellent moments in your life have been recorded by this handy tool. So when you update your iPhone to the latest iPhone 8 or iPhone 8 Plus, you may wish to move some precious memories from the old iPhone to new one, right? Of course, you can reach the goal with iTunes when you authorize the iTunes in the same Apple ID, but more and more users complained that some crucial data is erased during the sync process with iTunes, thus they may could like to find another way to transfer pictures between two iPhone devices. 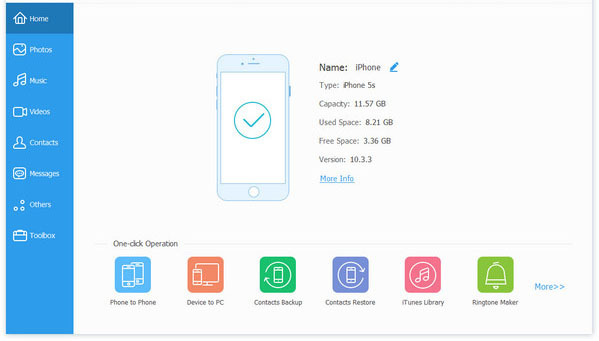 The recommended iPhone Transfer is a cross-platform application for portable devices, that empowers users to transfer data from one device to another with one simple click. 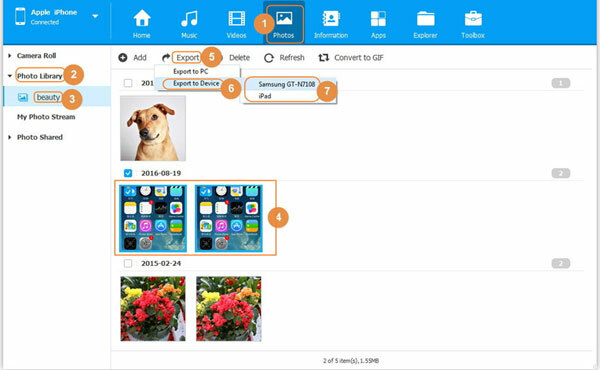 With it, you can easily move or transfer pictures, contacts, apps, music, messages, from one iPhone to another without losing or deleting any photos on the device. What's more, it can help you well manage the data on your new iPhone X or 8 Plus without iTunes. And you can use it to export, import, edit, delete any data on iPhone without any restrictions. Apart from iPhone, Android devices are also supported by this iPhone to iPhone Transfer very well. Now, just click the below icon to take a free trial by yourself! How Do I Transfer Photos from Old iPhone to New One without iTunes? 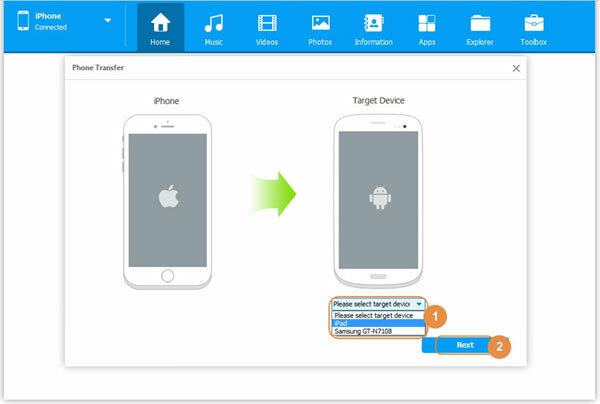 Select "Phone to Phone Transfer" mode, then If your find the phone is located in the wrong source and destination position, you can change the control panel. Be sure you're under the control panel of your old iPhone, then you can choose the new iPhone as your target target. Done! 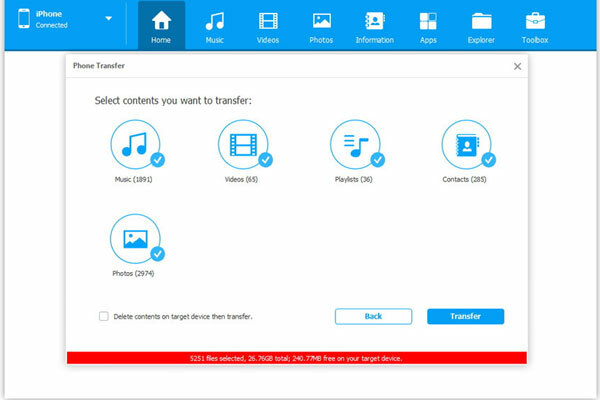 This is the way of transferring iPhone photos to iPhone on Windows computer. Actually, if you like to use the basic manager feature of this iPhone Transfer, you also can use it to export your iPhone photos to computer and then sync them to your new iPhone as you like. iPhone Music Transfer: How to Transfer Music from iPhone Xs/Xs Max/XR to Computer Freely? How to Sync Facebook Contacts with iPhone Easily? How to Transfer Music from iPod to iPod on Windows or Mac Computer? Wanna Save Instagram Photos on iPhone/PC? Here! How to Transfer Photos or Pictures from iPhone to iPhoto Easily? How to Transfer Music from iPad to iPhone X/8 Plus/8/7/6S/6? How to Transfer Photos from iPhone to iPad Easily? How to Transfer Music from iPod to iPhone X/8 Plus/8/7/6S/6? How to Transfer Photos from iPad to Mac OS X?